Hinrichs noted the Mustang’s impact goes well beyond the more than 9.2 million cars sold in its 50 years of continuous production. With thousands of appearances in films, television, music and video games and 8 million Facebook “Likes,” it may be the most popular car ever. 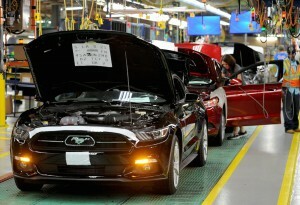 The Flat Rock plant has built Mustangs for the past nine years – surpassing the 1 million mark in 2013 – and in the last year it went through a $555-million transformation that has added a new fully flexible body shop to allow multiple models to be produced on the same line. The plant also produces the Ford Fusion. In addition, the other technologies recently incorporated into the Flat Rock, which was originally opened in 1987, include a new paint process, dirt detection and laser brazing. The plant was originally built by the Ford’s former Japanese partner, Mazda Motor Co. However, Ford bought out Mazda’s interest in the plant, which has approximately 3,000 employees working two shifts at full line speed, over a decade ago. The 2015 Mustang, which is an automatic contender for car of the year honors, features all-new front and rear suspension systems. At the front, a new perimeter subframe stiffens the structure and cuts weight, which provides better handling, steering and ride. Despite the fact that designers went back to the drawing board, so to speak, they kept the latest iteration to an evolutionary change rather than revolutionary. The Mustang fastback and convertible retained key design elements of the pony car, such as the long sculpted hood and short rear deck. Ford is also promising the new Mustang will offer a broad variety of options to fit different budgets and lifestyles. With more options to choose from, including the upgraded V8, which joined by a 3.7-liter V6 and an all-new 2.3-liter EcoBoost engine that brings state-of-the-art technology to Mustang. Much to the delight of many aficionados, the Mustang GT retains the 5.0-liter V8 – now featuring upgraded valvetrain, new intake manifold and improved cylinder heads – that yields 435 horsepower and 400 lb.-ft. of torque. 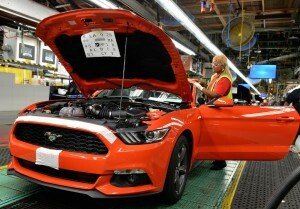 The addition of a right-hand-drive Mustang to Ford’s global vehicle lineup will allow the iconic pony car to be exported to right-hand-drive markets such as the United Kingdom, Australia and South Africa. This entry was posted on Thursday, August 28th, 2014 at and is filed under Automobiles. You can follow any responses to this entry through the RSS 2.0 feed. Both comments and pings are currently closed.